Have you ever wondered why when there’s a little tension in a relationship it can actually be a good thing? It adds interest and depth and a touch of the unexpected. It grabs your attention and leaves you wanting more. It can also be that natural balance of feminine and masculine energy. 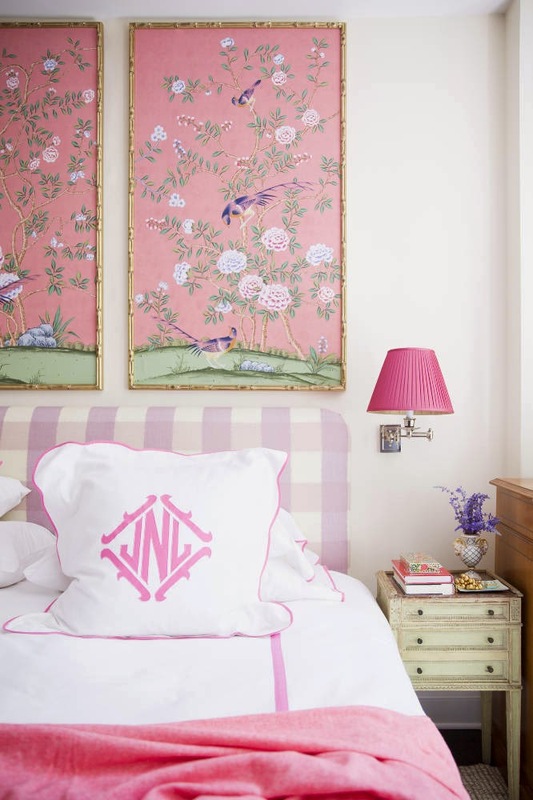 In my experience, the same rule applies to interiors! You want to keep a good balance of the Yin and the Yang—but the question is: How? 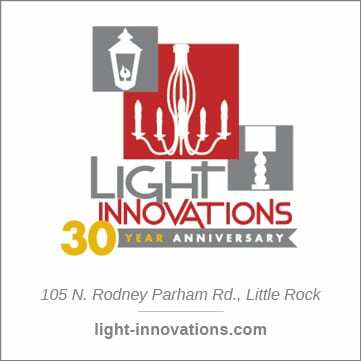 What primary characteristics should you be looking for in your various design elements? What details are the most important to include when merging masculine and feminine? I’ll use one particular home design to illustrate my points. 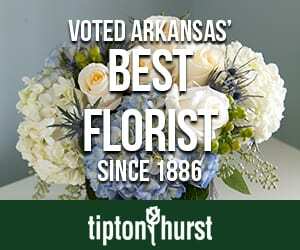 In this particular family the husband has long been “outnumbered” by his wife and two daughters, but I’ll show you why he still feels right at home in his own home. 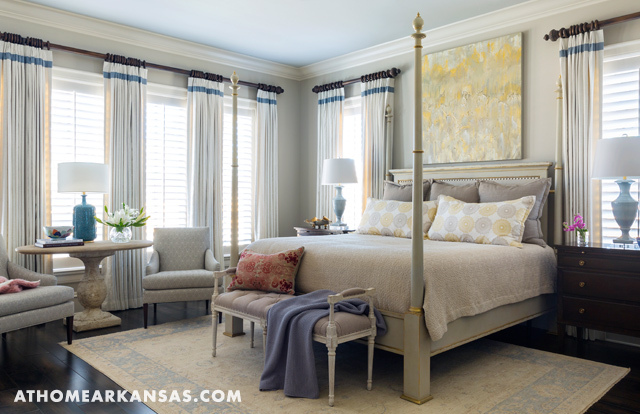 In the master bedroom, I’ve balanced the more feminine, softer blues and yellows with the masculine, darker wood of the nightstands and curtain hardware. The rough texture of the concrete side table is counterbalanced by a flirty floral arrangement. 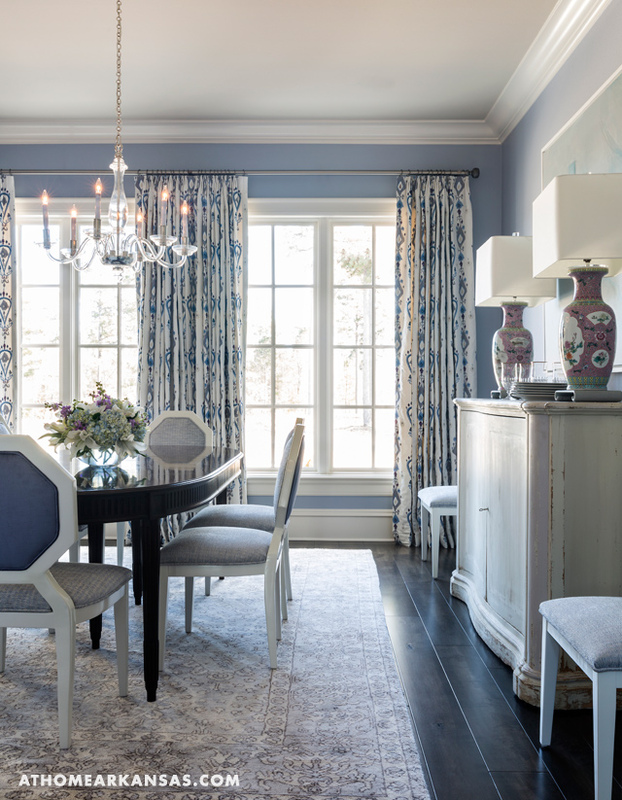 Even the more masculine lines of the Neoclassical lamp pair just perfectly with the soft blue/gray color. The textured modern art piece also has a more masculine energy. 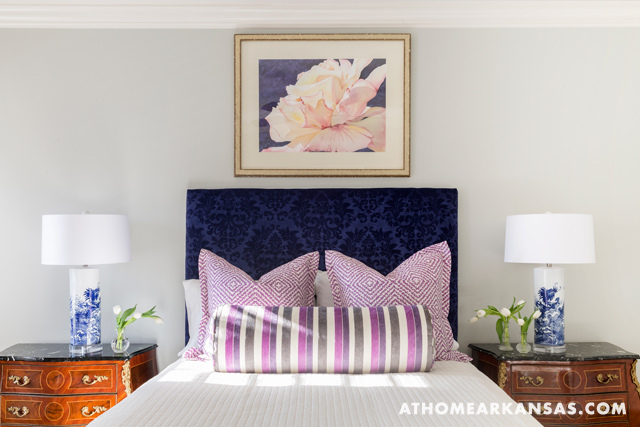 I added in a vintage, pink-and-linen pillow to add a little something unexpected and to keep the room from being a little “too” perfectly matched. 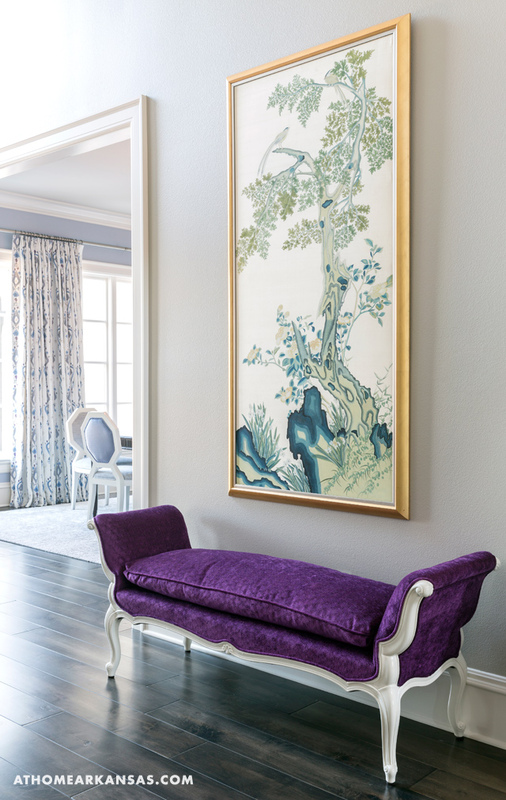 The deep, regal purple upholstery juxtaposed with the intricately carved bench and the hand-painted Chinoiserie textile keep this vignette fresh. 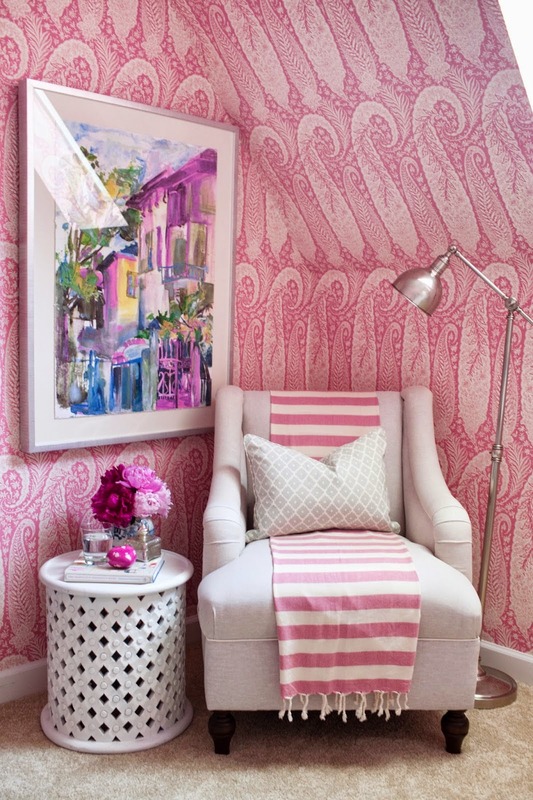 The color blush is making a huge splash at all the latest design-industry markets. 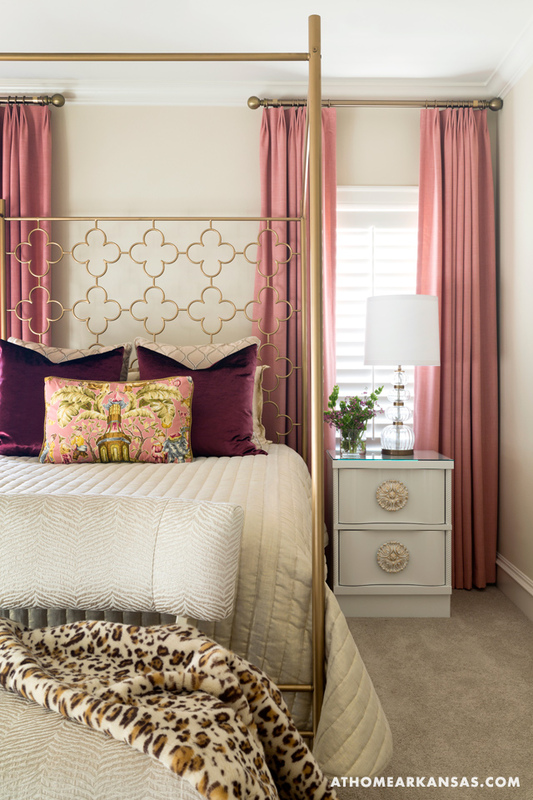 Though this bedroom reads very pink, I’ve actually layered texture and color to bring balance: the curtains are a linen/cotton blend in blush; the velvet bed pillows are a deep, manly oxblood; the animal print throw introduces even more texture and subtle masculinity, as does the Celtic quatrefoil design of the poster bed. The overall look is still very feminine but not sugary sweet. 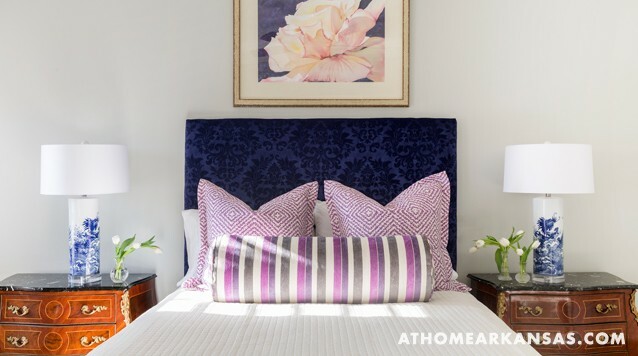 The strength of navy blue, along with the wide stripes and scale of the bolster pillow, balance the Damask pattern on the headboard and the floral watercolor painting above the bed. 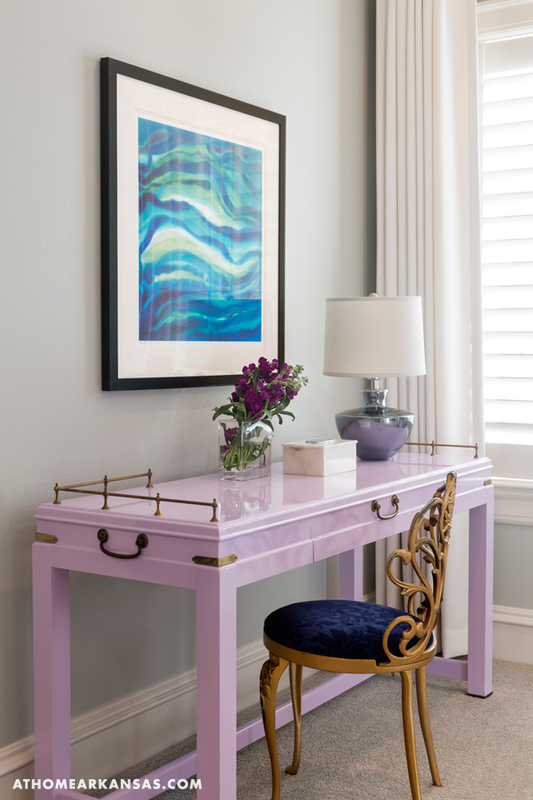 I love everything in this mix of the modern print in greens and blues above the lavender desk with studly brass accents and guilded vintage vanity chair. 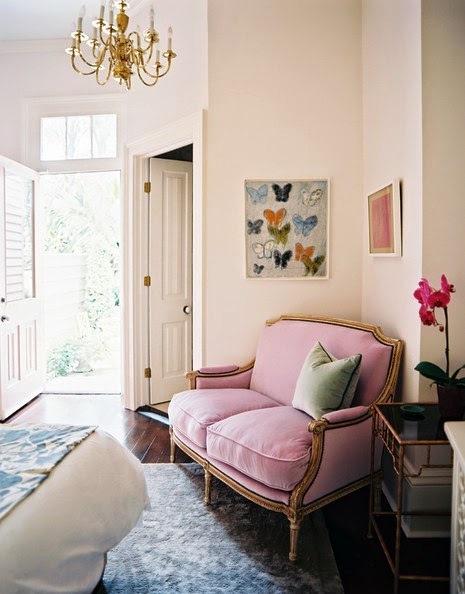 The hard edges of the octagonal dining chairs, the overscaled modern art, and the boxy lampshades, contrast with the pink Chinoiserie lamps and the graceful glass chandelier. Again, bringing in the dark wood dining table. Also, even though the wall color reads an ethereal blue – it is a more toned-down version than you would think of compared to a sky blue. 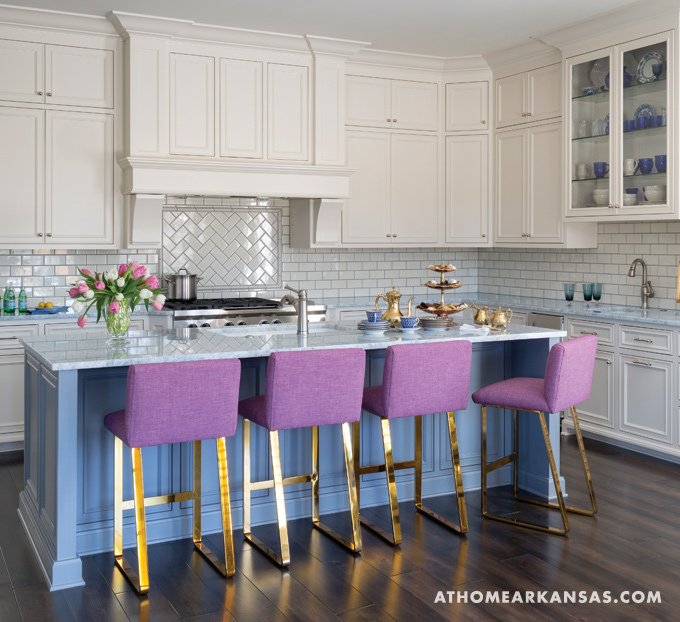 The straight lines of the brass barstools and the over-scaled, hammered texture in the lighting contrast with the orchid upholstery and fanciful, floral window treatments. 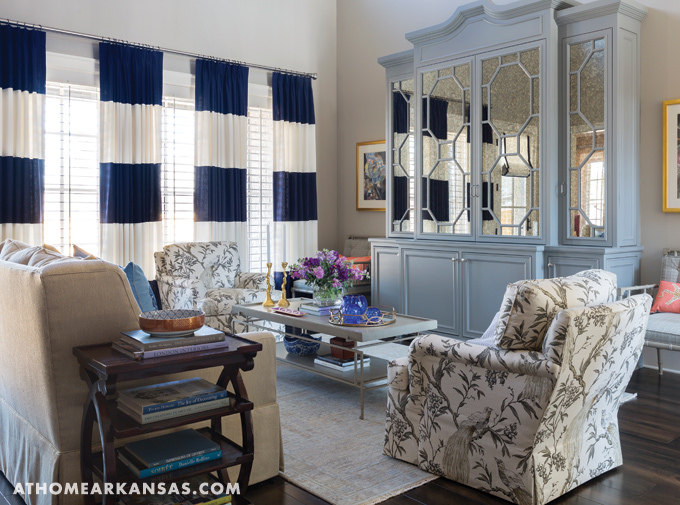 In the living room, the drapes are made of wide stripes of navy and off-white, and the repetition of the octagonal shape fretwork, backed with antiqued mirror in the built-in. Now that I’ve given you examples of how to create this balance between the masculine and feminine, do you think it’s something you would want to attempt to bring to your own home? Why or why not? Can you find more examples in these pictures than what I’ve described? 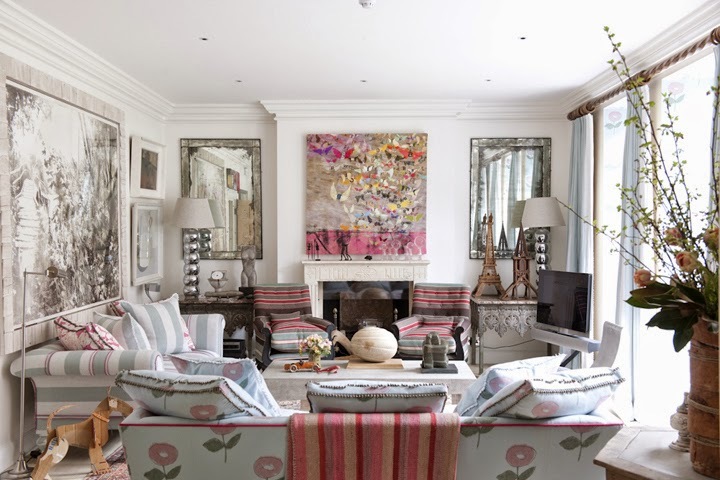 To tour the rest of this lovely home, see the feature in our April issue. 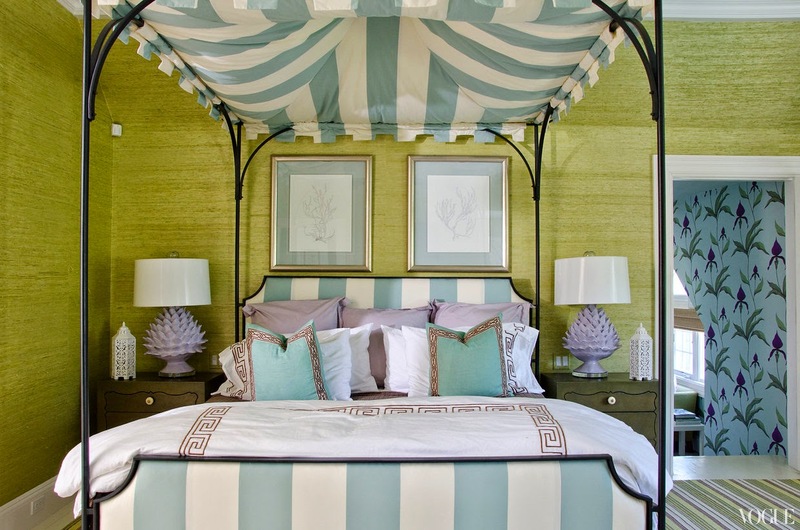 To learn more about Andrea and her work, contac Andrea Brooks, Andrea Brooks Interiors, El Dorado, andreabrooksinteriors.com.